WASHINGTON. Military Embedded Systems is excited to announce today the winners of our Best in Show Award contest held this week at the 55th Annual AOC International Symposium Convention, Nov 27-29 in Washington, D.C. Winning entries from military embedded systems exhibitors at the event are recognized for the improved performance and innovation they bring to military radar and electronic warfare applications. Four star, three star, and two star recognition will be given in multiple categories, with four stars as the top recognition. Winning entries are based on the counsel of an independent committee of industry judges. RFM3101. Photo courtesy of Mercury Systems. Mercury Systems' SpectrumSeries RFM3101 is an ultra-wideband microwave transceiver in a convenient 3U OpenVPX compliant form factor. This rugged product supports RF operation from 6 to 18 GHz with a 1 GHz IF bandwidth. Optimized for most demanding electronic warfare applications, the RFM3101 includes a versatile LO and delivers fast tuning speeds, low phase noise, and a low spurious response. MILTECH 9136. Photo courtesy of Milsource. Milsource's MILTECH 9136 from Milsource is a managed gigabit Ethernet switch on board (GESoB) that supports as many as 52 ports on a 3.4” x 3.4” foot print. The MILTECH 9136 is ideal for managing and switching large quantities of network-enabled devices in aerial and mobile military applications, with 24 1G ports of plug and play copper, eight ports 1G SFP fiber, four ports of 10G SFP+ fiber, and four QSGMII ports for an additional 16 1G fiber interfaces. It supports both Synchronous Ethernet (SyncE) and IEEE 1588 standards for time and frequency alignment across devices on military networks. Model 6001. Photo courtesy of Pentek. Pentek’s Model 6001 Quartz eXpress Module is an 8-Channel A/D & D/A with Zynq UltraScale+ RFSoC Processor. QuartzXM is a high-performance Quartz Express Module (QuartzXM) based on the Xilinx Zynq UltraScale+ RFSoC FPGA. The RFSoC FPGA integrates eight RF-class A/D and D/A converters into the Zynq’s multiprocessor architecture, creating a multichannel data conversion and processing solution on a single chip. WILDSTAR 6XB2 6U OpenVPX FPGA Processor – WB6XB2. Photo courtesy of Annapolis Micro Systems. The WILDSTAR 6XB2 6U OpenVPX FPGA Processor board from Annapolis Micro Systems is the first COTS [commercial-off-the-shelf] FPGA board with 100Gb capability and three UltraScale+ FPGAs. This 6U VPX Baseboard integrates two Xilinx Virtex UltraScale+ FPGAs and a Xilinx Zynq UltraScale+ MPSoC motherboard controller. The high-performance board also has two WILD FMC+ (WFMC+) next generation I/O sites, for dense, high-bandwidth ADCs and/or DACs. High-bandwidth backplane connectivity is enabled by MULTIGIG RT3 interconnects. The new high-density RT3 delivers 100Gb per Fat Pipe. ComEth4590a. Photo by Interface Concept. Interface Concept's Cometh4590a Dual Domain Ethernet Switch supports the latest VITA 65 Open VPX Slot and Module profiles that align with the Sensor Open System Architecture (SOSA) snap shot two. It has been specifically tailored to meet current high-speed Ethernet network data rates required by MOSA standards in development by the DoD. It is a 3U VPX 10/40 Gigabit Ethernet Layer 3 switch currently on the embedded market which has two separate and independent on-board Ethernet switch matrices - one for the Data Plane and one for the Control Plane. 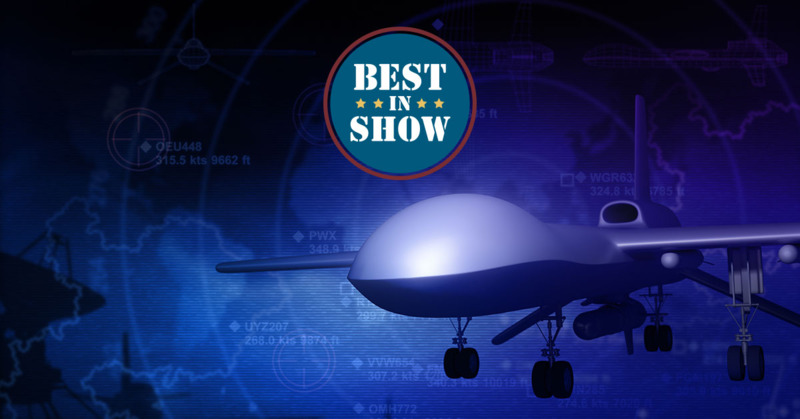 Walk the show floor for free and congratulate the winners and take advantage of the AOC International Symposium & Convention, the industry’s leading, three-day event that brings together professionals from 25 countries spanning industry, military, and government sectors. Didn't get a chance to submit your product to AOC 2018? Click here to get it in for the next show.